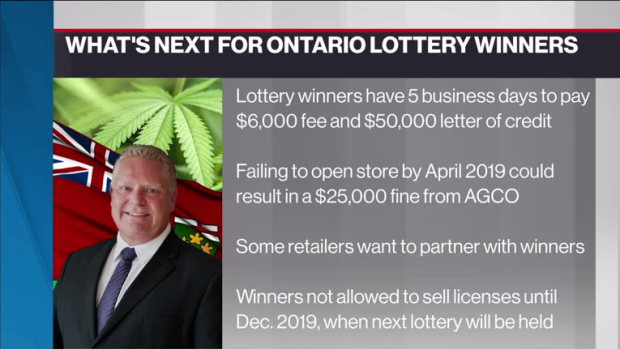 Some of Ontario's potential cannabis retailers say they are in wait-and-see mode after the province awarded 25 potential retailers the right to apply for cannabis retail licences on Friday. The country’s largest cannabis retailer – National Access Cannabis Co. (META.V) - was among the many companies shut out on Friday and its CEO viewed the lottery as a flawed process. “Taking 25 would-be, hopeful retailers, bringing them in and hoping that they’re going to be successful? That’s very low probability,” said Mark Goliger, the company’s CEO, in an interview with BNN Bloomberg on Monday. NAC, which operates seven cannabis stores in Manitoba under its Meta brand and 14 in NewLeaf-branded locations in Alberta, landed between 10,000th and 13,000th-place on the waiting list for a licence in Friday’s lottery, according to Goliger. Goliger said that Manitoba’s process – which picked four retailers for licences based on requests for approval – better equipped the province for a successful retail environment. One retailer looking to get into cannabis sales is the iconic Friendly Stranger cannabis culture shop in downtown Toronto, which has been selling accessories and paraphernalia since 1994. The company aims to expand its footprint and has recently purchased a company called Happy Dayz, which operates nine retail locations specializing in pipes, vaporizers and other cannabis accessories in the Greater Toronto Area. Although Friendly Stranger was also unsuccessful in the lottery, James Jesty, the retailer’s president, said that the process has helped settle some of the retail speculation in the province. Goliger and Jesty expressed optimism that licences may become easier to come by once Ontario is able to eradicate its cannabis supply backlog, which the executives estimated should happen by mid-2019.